Peacefully, after a long life, Jean Ruchkall passed away at East-Gate Lodge in Beausejour on Friday, August 10, 2018 at the age of 103 years. Predeceased by her beloved husband Frank in 1994 and her first-born son Ronald in 1955, Jean will be lovingly remembered by her daughter Mary Jane (Rick) Stefansson and sons Wallace (Janet) and Gerry (Barbara) Ruchkall. Also left to cherish her memory are her grandchildren Richard (Debbie) Stefansson, Jan (Andy) Baker, Kris (Jan Pedersen), Jay (Bonnie) Stefansson, Rhonda (Brent) Hopkins, Lisa (Oliver) Lee, and Tim Ruchkall (Alison Barr). 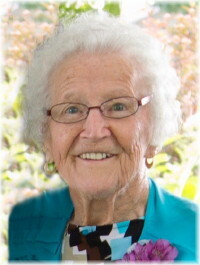 Granny, as she was affectionately known by all, will also be fondly remembered by her great-grandchildren Drew (Chantal), Reid (Alannah) and Riley Baker; Torrie, Kaylee and Shaylyn Stefansson; Gena and Kiara Stefansson; Carley, Lindsey and Grafton Hopkins; Sophie Lee; and Hannah Jean Ruchkall. Jean was the last surviving member of her family and was predeceased by brothers John, Bert, Walter and Lawrence Chmielnicki, and sisters Sophie Pronishen, Stella Solar and Mildred Lasch. Jean was born in Melrose on December 3, 1914. In 1934, she married Frank Ruchkall and together they operated a mixed farm in Hazelridge, Manitoba where they enjoyed 60 years of marriage. Their home was often the centre of lively, sometimes impromptu gatherings of family and friends, and Granny was always the hostess with the mostest, welcoming one and all, making sure no one ever left hungry. Always an independent woman, her proudest achievement was obtaining her driver’s licence at the age of 63, which gave her a real sense of freedom. Granny was known for her cooking, baking and gardening skills, but will best be remembered for her wonderful sense of humor, which we will all miss terribly. She was a kind, generous, hard-working individual who was an amazing judge of character. Later in life, she enjoyed traveling to the southern US, the Caribbean, Spain, Monaco, Italy, Morocco and Greece. The family would like to thank the staff at East-Gate Lodge for taking such excellent care of our Granny these last few years. A big thank you as well to Sobering Funeral Chapel for their kind and compassionate care. In accordance with Jean’s wishes, cremation has taken place. A private funeral will be held on Tuesday, August 21, 2018 with interment to follow at Eastdale cemetery. In lieu of flowers, donations may be made to East-Gate Lodge, Box 1690, Beausejour, Manitoba, R0E 0C0. So sorry to hear about your Mom & Granny’s passing.She was a lovely and gracious lady, with a great sense of humour. You will have many beautiful memories to cherish. You have enjoyed so many happy years together, she will surely be missed. My deepest condolences to all for your loss. Thinking of you, Gerry and Barb and your whole extended family. What a wonderful life your mother had! I remember very well meeting her when I visited Winnipeg many years ago. Our sincerest condolences on the loss of your mother and my aunt. I have pleasant memories visiting the farm with my parents Mike and Mary Kula. Your mother always made me feel welcome and special. I am glad you had so many special years with her. A loss of a mother is always tough despite their age. With Sincere Sympathy and Understanding at this time of great loss. Jean was a beautiful person and I so enjoyed getting to visit with her at Helen’s. The cherished memories of your Mom and your Aunty will be a treasure to carry with you always. We are very sorry to hear about the passing of Granny. Gerry I know you will miss her, as we all miss our parents… she had a long and wonderful life RIP Granny.